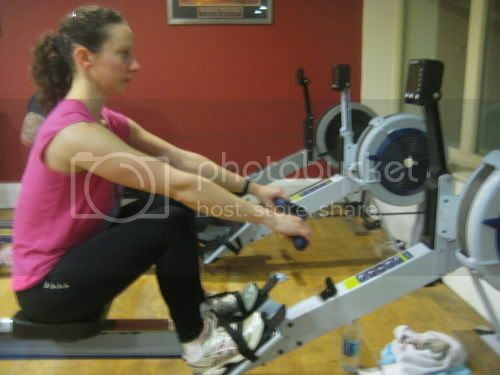 Indoor rowing is one of the most misunderstood exercises in the gym. This is partly because indoor rowing is somewhat counter-intuitive: it looks like a machine where you just pull on the handle as hard as you can. Few people really think that going on a treadmill and running flat out for as long as you can is a good way to train. 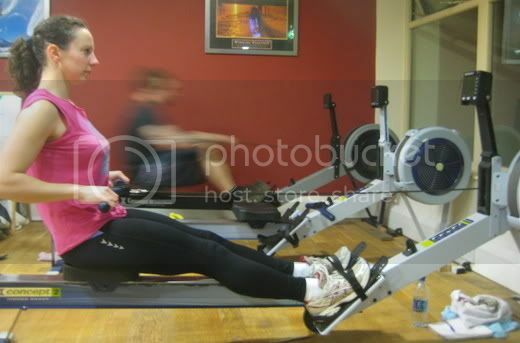 But I see people do this on the rower all the time. In fact, I used to do it myself when I first joined the gym! But while creating a lot of sweat and getting puffed out might make you think you are getting a good workout, you can achieve so much more once you improve technique. You will generate more power, use more of your body, go faster and be able to row for longer. You don’t have to be ‘into’ rowing or want to compete in order to benefit from better technique. Plus, you won’t look like a newbie in the gym! The most important thing to understand about the indoor rower is that the numbers are measuring the speed of the flywheel, not you. So doing faster strokes doesn’t necessarily make the wheel go faster. It’s the amount of power applied to the wheel that makes it go. The power comes from the legs, trunk and arms working together and applying force to the machine. The majority of the power comes from the legs, not the arms. According to Concept2, the leading manunfacturer of indoor rowers, your legs are responsible for 70% of the power in your stroke. Good technique is all about getting this right, which allows you to generate more power on the wheel. I am sure that everyone reading this has either seen an indoor rowing machine in action or used one. Sitting on the sliding seat with your feet on the footpads and your hands on the handle, you push back as far as your legs will take you and then slide forward ready to push back again. Good rowers have a smooth flowing motion. You will notice that they move faster and more forcefully on the push back than they do on the slide forward. It is the push back, or the drive, that makes the wheel move. The slide forward is your opportunity for recovery. Before starting to row, adjust the footpads so that your heels are as high as possible and make sure they are the same height on each side. The straps should go over the bottom of your shoelaces, i.e. quite high up the foot. This is because you need your feet to bend when you push off the balls of the foot. Unless you are very flexible, you will need to let your heels come off the footpads in order to get your legs in the optimum position to push back. The optimum position for the legs at the catch (just before you push back) is shins vertical. Most people don’t come forward enough for their shins to be vertical. In the picture above, my shins could be a tad further forward. If I had longer legs, my knees would be poking up between my arms at this point. If you are not very flexible, it is tempting to let your knees tip outwards in this position as you try to get your hips forward. But if your knees are bending outwards you will lose a bit of power on the drive back, so try to avoid this or actively work against it by thinking about pulling the knees in. Whatever you do, don’t have your arms on the insides of your knees. If you simply can’t get close to the shins vertical position at this stage, just go as far forward as you can; your flexibility will improve over time. And for you very flexible people, it is not advisable to come too far forward so that your bum is almost touching your heels. You do need to keep a couple of inches gap between the seat and your heels in order to generate maximum power. On the drive back it is very important to push hard with your legs, as this is where most of the power comes from. The arms do contribute with a pulling motion but if you don’t push with your legs you will not be able to maintain high speeds for long. The power comes from straightening, or extending, the knees and the hips. The leg drive is very similar to a squat and the idea is to get faster as you move back. This can be quite tricky to get your head around at first. When I first started rowing, I didn’t get the concept of increasing speed as you move back. There just didn’t seem to be enough time! However, now that I’ve got it I can see that I simply wasn’t pushing hard enough with my legs. When you do, you automatically move faster as you slide back. It’s hard to do this straight off the bat, so get rowing first and get into a rhythm, then focus on pushing as hard as you can with your legs and you will see what I mean. One word of warning though: if you exaggerate the leg drive too much, you can actually end up pushing forcefully back with legs and hips but not bringing the handle back with you (called ‘slide shooting’). Remember to move the handle and the seat at the same time. In other words, maintain the angle of your back until your legs have straightened. Keep your back straight and chest up throughout the stroke. A common technique error is rounding the upper back and shoulders at the catch. This happens when people are only thinking about pulling with their arms. But as we know, most of the power comes from the legs, from the knee and hip extension. Think of your back as a lever, opening your body at the hip. If your back is rounded, it is not going to be as effective as a lever. As you drive backwards, use the weight of your trunk to add force to the stroke at the end by leaning back slightly. This finishes the process started by your legs. It is important not to over-lean though. In the picture above, I could afford to lean back a few more degrees – and if I was rowing hard, I would. But that would be enough. At the catch (the forward position), your arms should be straight. As you drive backwards, your arms pull straight back, elbows slightly flared as you bring the handle into your chest. Watch out that your wrists are straight; it’s easy to get into the habit of curling the wrists under slightly as you pull into the chest. It is important to keep the cable as straight as possible and for the cable to travel in a straight line, otherwise power will be dissipated. If you’re not careful, your knees will get in the way and you will find yourself having to lift the cable over your knees as you slide forwards or backwards. The way to avoid this is to let the handle pass your knees first, before allowing the knees to rise. So from the front position, you drive back hard with the legs and keep the handle slightly in front of your knees until your legs have straightened out, then finish the stroke by pulling the handle into your chest and levering your trunk backwards. On the recovery, let your arms straighten first and allow the handle to come back past the knees before you bend them to slide forwards. When you are not used to this process it can be a bit jerky so try to make the stroke as smooth as possible. It doesn’t take long for this to become a flowing movement. Keep your head looking straight ahead. Make sure you set the computer display on the rower so that your head is in the right position when you are looking at it. A lot of people have the display a bit too low. Check out http://gubernatrix.co.uk/2008/03/indoor-rowing-training/ for how to train with the indoor rower, including ways of measuring your rowing and using the numbers on the computer display to help you improve. In this video, Angela goes into more detail about some aspects of technique. The concept2 website is also worth a look as they have some good resources and information. 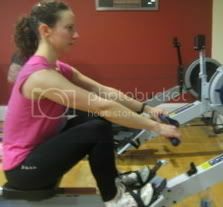 In particular, check out Technique on the Indoor Rower, part of the Concept2 online rowing guide.